NEW Port Stop for RLC 8! We’ve got some great news folks! The RLC 8 2020 itinerary has changed. We are now headed to George Town, Grand Cayman! Yep, you heard correctly, Grand Cayman. So make sure you have October 16th, 10:00 am (ET) marked on your calendar. That’s when booking for RLC 8 goes live! We’ve also got a tip to make your reservation go smoothly. CLICK HERE to register in advance, if you haven’t already. That way, when the time comes and you’re frantically trying to get online to book your cabin, the only thing you need to do is login, select your cabin, pay and BAM! you’re done. In and out within minutes!! Of course, be sure you write your username and password down. 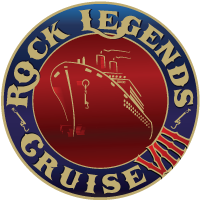 If you’ve cruised with us before you likely are already registered. Just be sure you know which email address and password you used. You can CLICK HERE to do a test sign in and reset your password if needed. This was our first RLC, we REALLY wanted to do this one because of Uriah Heep and The Circle. The fact that Steppenwolf, Blue Oyster Cult, and Bad Company were on it also just sweetened the pot. It was our first time seeing Todd Rundgren, Gary Hoey, Quiet Riot, Artimus Pyle and Elvin Bishop, who were all great! We caught parts of some of the other bands and unfortunately some not at all. We didn’t leave the ship at all because there just too much GREAT music! The artist we met were all very nice. Loved the Meet and Greets. And now we have new bands to follow. My only complaints ( and they wouldn’t stop my husband and I from returning) were the saving of the chairs with towels, and the staff in the buffet room seemed ill equipped to handle the crowds, which were predictable. Also, I thought the buffet room should have had longer daytime hours, that would have helped with tables not available. But we weren’t there for the food or the destination. We were there for the non stop music. Gary Hoey and the All Star Jam was the best surprise, we didn’t move for 3 hours, didn’t want to miss a second of that great show. Gary was a terrific host. We will be back! Oh and fun swag too!